Lake Erie P Issues More on this topic. 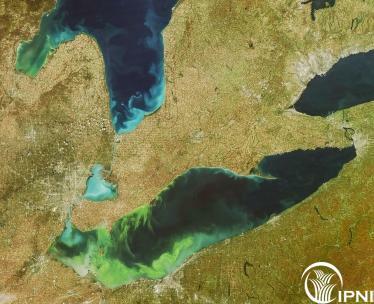 Cropland in the Lake Erie drainage basin is under scrutiny again as a potential source of the phosphorus (P) that is thought to be fuelling the burgeoning algal blooms. Lake Erie algae was especially severe in the summer of 2011, and rose again to unexpectedly high levels in 2013. No one knows fully why loads of soluble P in the rivers are increasing, but we know enough to say that placement and timing practices are important for responsible management of plant P nutrition. Opportunity has arrived for 4R Nutrient Stewardship to demonstrate responsible care. Recent soil test summaries and cropland nutrient balances show that rates of application are trending in the right direction. Placement and timing are the keys to keeping the P where plants need it and to protecting it from loss to water.